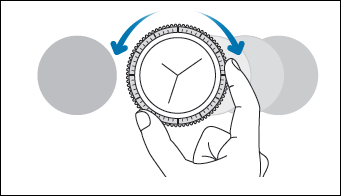 [Gear S3] How is the thickness of the device measured? Gear S3 frontier and Gear S3 Classic versions are 12.9mm thick. not to the control bezel around it. The Gear S3 has been designed by analog-inspired, circular interface for easier navigation between screens. The Bezel control provides unimpeded view of the screen and physical feedback enables quick and precise navigation.